Advantages: Norton SG ceramic mixed with premium heat treated aluminum oxide grain; blue fiber, reinforced, free of pigment; water-based No-Fil layer; faster shear rate; consistent and even scraping; combines resilience with resistance; removes clogging during use; prolonged life; lesser downtime. The MULTI AIR PLUS is available in a grain range: P80-120-150-180-220-240-280-320-400-500-600-800. Multi-Air Plus Discs are designed for the most demanding applications for grinding on primed and painted surfaces, composites and non-ferrous metals. This product range is particularly suitable for sanding harder or harder surfaces such as ceramic tiles. 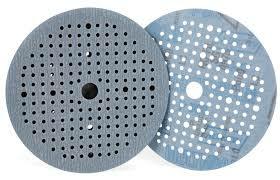 Using a combination of SG and heat-treated alumina beads, Multi-Air Plus delivers the most aggressive, sharp cuts ever. With excellent wear resistance, it has the longest life, up to twice as long as conventional projects. Multi-Air Plus achieves a more consistent and unified scratch pattern, maintaining the desired surface and higher cutting speed.